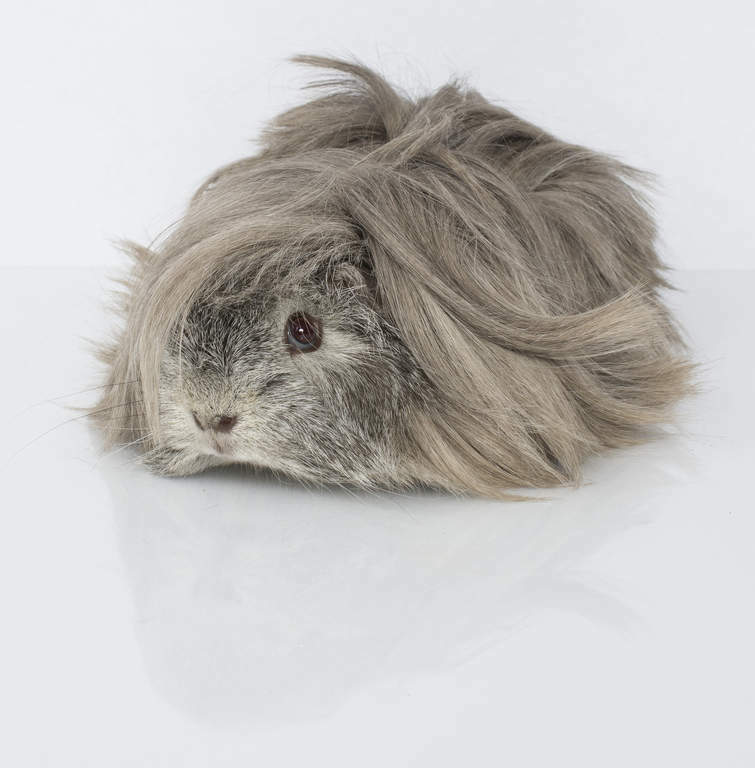 The Peruvian is one of the oldest breeds of guinea pigs, having been established in this country for well over 100 years. They are believed to have come over to this country from South America via France. 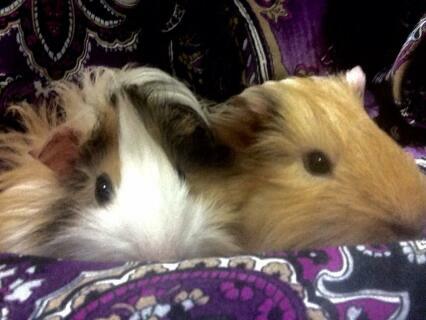 They are basically long-haired rosetted guinea pigs, they are born short haired, with two rosettes. 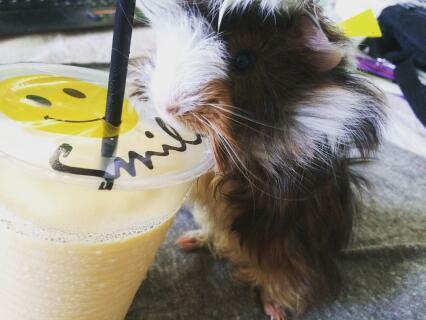 As the guinea pig grows, so does its hair, and the top hair parts and grows downwards. The hair around their bottom can reach 20 inches in length, and they have a long fringe which covers their eyes. They are not pets for the faint-hearted! 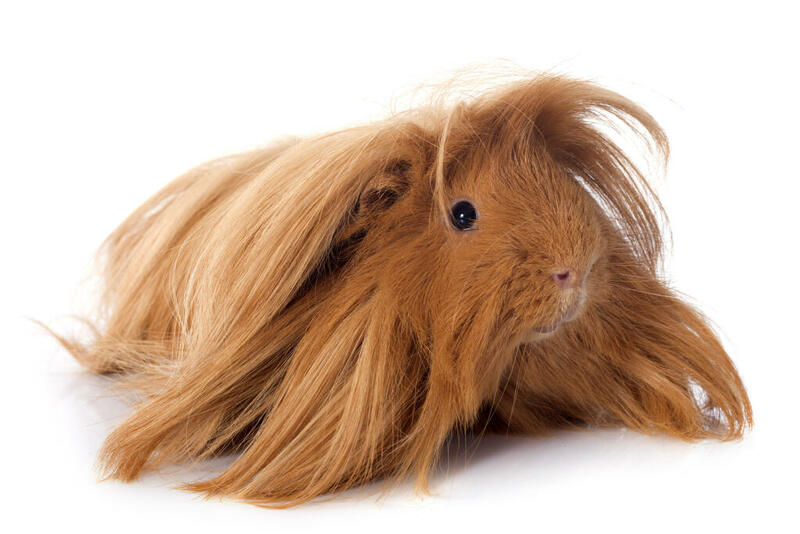 If they are kept as a pet their hair is best trimmed, and they require regular grooming and bathing. Without constant care their hair becomes readily matted. If they are kept for showing then their flowing locks are usually kept in wrappers (curlers!) to keep them clean. Peruvians also have a tendency to chew each others coats, a behaviour known as barbering, and show stock may have to be kept by themselves. Peruvians come in a variety of colours, the most popular being tricolour (slate, cream and white) or a mixture of two colours, slate and white, cream and white, or slate and cream. My Peruvian sow is so chilled out and friendly to both other piggies and humans. She is a very devoted mother and not shy at all despite being unhandled for the first 6 months of her life. Summer in QLD will mean she gets her hair trimmed right back and she has had some matting over the winter but she is happy for me to cut it off when needed. Hoping she goes ok over this very hot summer to come. 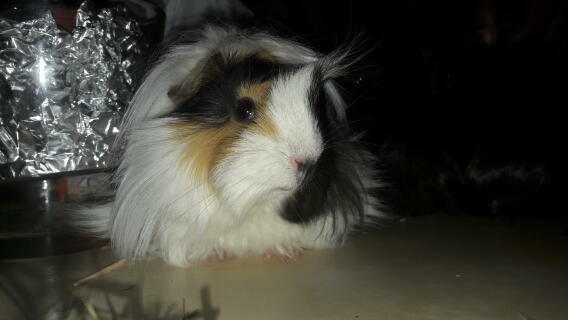 I have a cream and white Peruvian female named Daisy. She's under one year old but old enough to know better about her terrible behaviour! 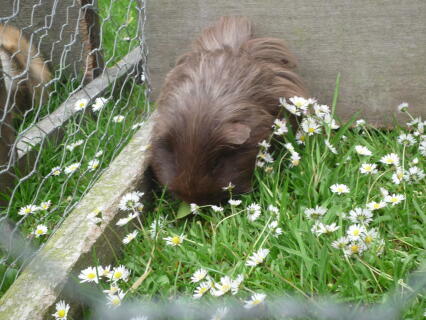 When I first got her she was a scared little guinea pig that was shy around humans and guinea pigs. Now she's older she has grown in to a big bully! 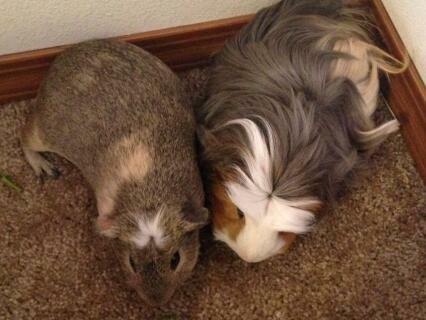 All of my other guinea pigs are scared of her. She's by far my biggest guinea pig and her hair makes her look even bigger, she knows this and uses it to her advantage. If another pig is in her way or she is hormonal she will not hesitate to start a fight with them. By fight I mean pointless one sided beat up. I have been bitten by her when separating fighting guinea pigs. My 4 year old ginger agouti cannot stand her and has to be kept separate from her at all times otherwise they will both fight violently. Despite being a bully towards other pigs she is scared of people! The saying "bullies are cowards" is true here! All my other 3 pigs run out and squeak to greet me, she doesn't, she just stays hiding in the box. I have the same problem as another user has stated, she screams whenever I try to comb her. Good for breeding (I haven't bread her) as she's a hormonal little thing and isn't shy about showing it. She takes it way over the top. She put my poor FEMALE Abyssinian (2 weeks older than her) in vet hospital because she tried to mount her too many times! 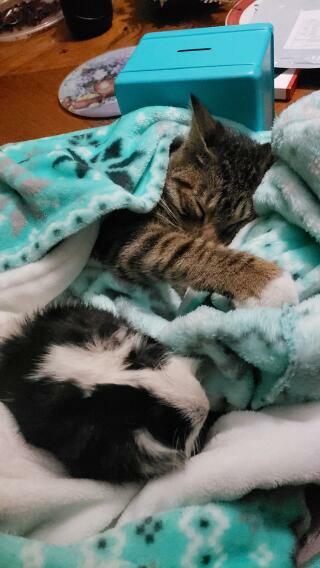 All the jumping on her back temporarily PARALYSED her back legs for a few days! Anti-inflammatory drugs from the vets aren't cheap! Despite all this I still love her as she is really cute and is nice to cuddle. I have a 17 month old female peruvian guinea pig called Fay and she is terrible, she is a poorly behaved guinea pig who hates being brushed, everyday i brush her (against her will) and everyday i get bitten but still i love her like she was my daughter!! If you are not used to guinea pigs or you dont have much time to spare of all guinea pigs don't get a peruvian or you will end up like me having to brush a screaming guinea pig everyday for 7 - 8 years a complete waste of my time! thats why i don't really like this breed as much as Rex! 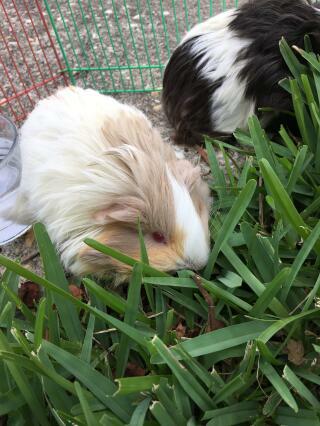 Really friendly and laid back guinea pigs , a pleasure to own. Keep their fur trimmed in a nice `bob` to keep it tidy and it stops them picking up stray bits of hay in it. 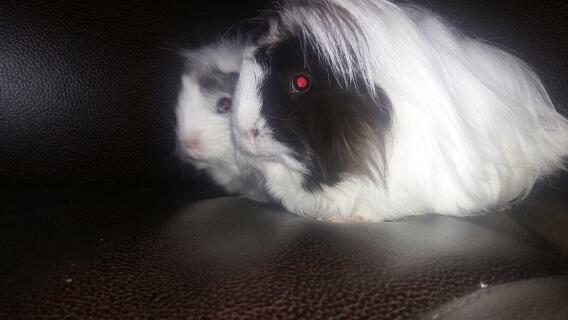 lovely friendly guinea pigs i`d highly recommend them!